Bonnie (Eshelman) Collins Hadsell passed away on Monday, May 15, 2017 at Hillcrest Nursing Home in Blackwell. A funeral ceremony for Bonnie will be held on Monday, May 22, 2017 at 2:00 p.m. at the Trout Funeral Home Chapel in Blackwell with burial to follow at Caldwell Cemetery in Caldwell, Kansas. Friends and family may come by the funeral home to pay their respects on Saturday, May 20, 2017 from 9:00 a.m. to 8:00 p.m. and on Sunday, May 21, 2017 from 1:00 p.m. to 8:00 p.m.
Bonnie was born on October 27, 1927 to Ira Eshelman and Alberta (Lakey) Eshelman on a farm in Grant County Oklahoma. She attended grade school at a country school in Lone Elm and high school in Caldwell, Kansas. She received her Bachelor's Degree from Phillips University in Enid, Oklahoma. Bonnie married Wilford "Bill" Ray Collins on March 19, 1950 at the Christian Church in Caldwell. They were married 47 years before his death in 1997. On April 16, 2005 Bonnie married Floyd Hadsell and they lived in the Blackwell area. Bonnie was a fifth grade teacher and taught at the schools in Deer Creek and Lamont as well as in Burke, South Dakota. After retiring in 1990, Bonnie became a member of the Grant County Retired Teachers Organization. 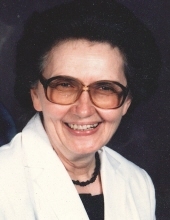 Faith was a large part of Bonnie's life as she was a member of the Wesleyan Methodist Church in Blackwell, the Lamont Baptist Church and, later, attended First Christian Church and Christ's Church both in Blackwell. She enjoyed her family, homemaking, and gardening. Bonnie was preceded in death by her husband, Bill, brother, Earl Eshelman, sisters, Eunice Stewart, Edith Brannan, and Mabel Eshelman. Casket bearers will be: Wilford Collins, Samuel Collins, Benjamin Collins, Morgan Collins, Westin Collins, and Andrew Coufal. To send flowers or a remembrance gift to the family of Bonnie Jean Hadsell, please visit our Tribute Store. "Email Address" would like to share the life celebration of Bonnie Jean Hadsell. Click on the "link" to go to share a favorite memory or leave a condolence message for the family.